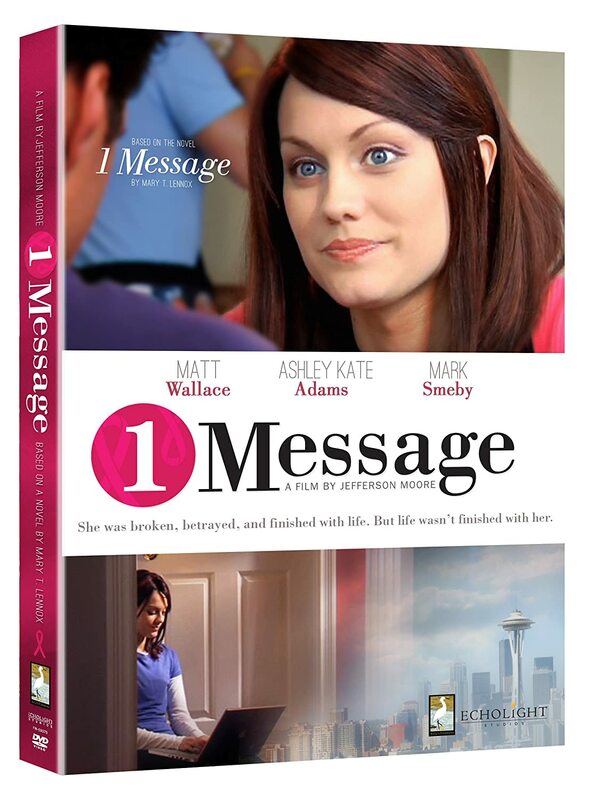 1 Message is a film inspired by the book of the same name written by Mary T. Lennox. I think more movies like these should be made. Ones that remind people, specifically girls, and young women that they are beautiful. A reminder that they’re not just anything, that they were created by the Creator of everything. I think this Christian movie holds very important themes and is full of hope. 1 Message tells the story of Becca, a 20-something woman who seems to be living quite the perfect life but that life suddenly comes to a halt when she discovers that she may have cancer. At the start of this Christian movie we meet Becca Norris (played by Ashley Kate Adams) and her life is considered perfect. She has the job she’s always wanted, she has a good-looking fiancée and to top it all off, she feels she has perfect features, therefore, she’s considered beautiful. She was bound to have it all and be successful. But soon that perfect world Becca knew of was suddenly gone up in smoke. Becca is diagnosed with breast cancer. So in just a few days, the life she once had known was no longer there, her world was crashing down. Suddenly Becca from 1 Message loses her beloved job plus her fiancée decides to end the relationship. At the doctor, Becca is recommended to do a mastectomy so the cancer can be stopped, she agrees but is faced with a realization, her “perfect” looks, what she had left, was now gone too. Now in this Christian DVD, Becca is shattered and broken, she doesn’t want anyone to see this version of her so she decides to step back and stay in her home. Becca doesn’t want to see anyone or let anyone see her, she doesn’t want to talk to anyone all she wants to do is stay hidden and retreated. Her house is her new environment but she’s living a sad life and Becca becomes quite depressed. Her friends try everything they can to communicate with her but she refuses to answer any attempt at communication. Becca from 1 Message feels like there’s nothing in life she wants to live for and grasps a pessimistic way of looking at life. Then one day in this Christian movie, Becca receives an email from someone named Dean. As they start sending emails back and forth, Dean takes the time to speak life into her heart with messages filled with hope and reminds her of her purpose as she’s struggling to find her own. One of the things Dean makes sure to tell her is the meaning of true beauty. After the surgery Becca endured, she feels as if she’s not as beautiful as the standard reflected in society of how a woman should be. Because of this Becca immediately feels like she’s no longer beautiful. Dean takes the time to remind her that beauty is indeed found on the inside, not on the outside. That the inside, how we are truly is what truly matters. At first, Becca is unsure of this new way of viewing beauty but soon begins to believe that kindness and other good qualities are what makes a woman beautiful not necessarily her outer appearance. Becca had fallen into a depressed life and was suddenly afraid to be seen and afraid of the fact that anyone could look at her and quickly judge her. She didn’t want to be pushed away and quite frankly was afraid of leaving her house. Becca from the Christian movie 1 Message has created this shield to protect her and the idea of changing her life is extremely scary for her. Dean makes sure she knows that there could be no courage without fear. He makes sure to challenge her to look those fears in the eye, all of them big or small. To face her fear of getting up and walking out of her front door. Just like beauty comes from within, courage is also discovered on the inside and with that comes faith. What will Becca do now? Will she be able to conquer her fears and face the world? Or will she just give in to the sadness she’s feeling? Find out more about Becca’s character and what she decides to do by purchasing the Christian movie 1 Message at the Fishflix store!